Debjani Ganguly is Professor of English and Director of the Institute of the Humanities and Global Cultures at the University of Virginia. She works in the fields of world literature, postcolonial studies and South Asian Studies. Her research interests include literary and new media forms, theories of the novel, technologies of violence, war, human rights and humanitarianism, caste and dalit studies, and Indian Ocean literary worlds. She is the author of This Thing Called the World: The Contemporary Novel as Global Form (Duke 2016) and Caste, Colonialism and Counter-Modernity (Routledge 2005), and General Editor of the Cambridge History of World Literature (2 vols. forthcoming 2020). She is also the General Editor of the CUP book series Cambridge Studies in World Literature. Her other books include Edward Said: The Legacy of a Public Intellectual (ed. 2007) and Rethinking Gandhi and Nonviolent Relationality: Global Perspectives (ed. 2007). She is currently working on a monograph provisionally called Catastrophic Form at the Limits of the Human. This project explores the contemporary novel and its mediation of human/posthuman life-forms in the era of techno-security and biogenetic capitalism, and anthropogenic climate change. Three catastrophic scenarios feature in this study: industrial/nuclear accidents, drone warfare, and devastated coastal ecologies. The larger horizon of this research lies in the emergence of a vibrant interdisciplinary discourse on how biological, technogenic and geological understandings of human beings relate to notions of political belonging and social justice. Debjani has held visiting fellowships at the University of Chicago, University of Cambridge, University of Oxford, and University of Wisconsin-Madison. In 2015, she was on the seminar faculty of the Harvard Institute for World Literature. She is a Life Fellow of Clare Hall, Cambridge, Fellow of the Royal Asiatic Society of Great Britain and Ireland, and a member on the advisory boards of the Harvard Institute for World Literature, the Consortium of Humanities Centers and Institutes (CHCI), the International Comparative Literature Association (ICLA), and the Academy of Global Humanities and Critical Theory (Bologna). 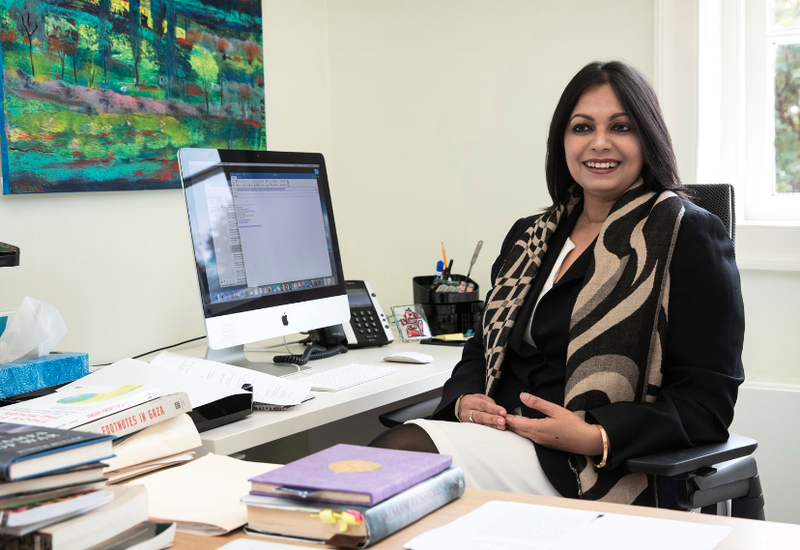 Prior to her arrival in UVA, Debjani was Director of the Humanities Research Centre, and Associate Professor of English at the Australian National University (ANU), Canberra. An Australian citizen, she completed her doctoral work at ANU in 2002, and served as tenured faculty in the Department of English at ANU until 2015.